Ken Patrick is perhaps the least-traveled trail on the already sparsely crowded North Rim in Grand Canyon National Park. Most visitors seek short and easy hikes that pack in a lot of canyon vistas, and if this describes you, then Ken Patrick Trail does not belong on your list. However, if you desire solitude in the forest and a wilderness feel on a long and pleasant hike, then Ken Patrick is perfect. On a map the route looks a bit contrived because it connects points that can easily be driven to, but the seldom-seen terrain in between is the real attraction of this trail. 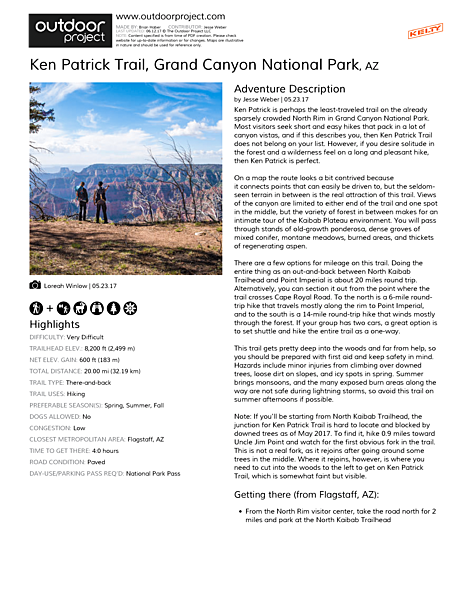 Views of the canyon are limited to either end of the trail and one spot in the middle, but the variety of forest in between makes for an intimate tour of the Kaibab Plateau environment. You will pass through stands of old-growth ponderosa, dense groves of mixed conifer, montane meadows, burned areas, and thickets of regenerating aspen. There are a few options for mileage on this trail. Doing the entire thing as an out-and-back between North Kaibab Trailhead and Point Imperial is about 20 miles round trip. Alternatively, you can section it out from the point where the trail crosses Cape Royal Road. To the north is a 6-mile round-trip hike that travels mostly along the rim to Point Imperial, and to the south is a 14-mile round-trip hike that winds mostly through the forest. If your group has two cars, a great option is to set shuttle and hike the entire trail as a one-way. This trail gets pretty deep into the woods and far from help, so you should be prepared with first aid and keep safety in mind. Hazards include minor injuries from climbing over downed trees, loose dirt on slopes, and icy spots in spring. Summer brings monsoons, and the many exposed burn areas along the way are not safe during lightning storms, so avoid this trail on summer afternoons if possible. 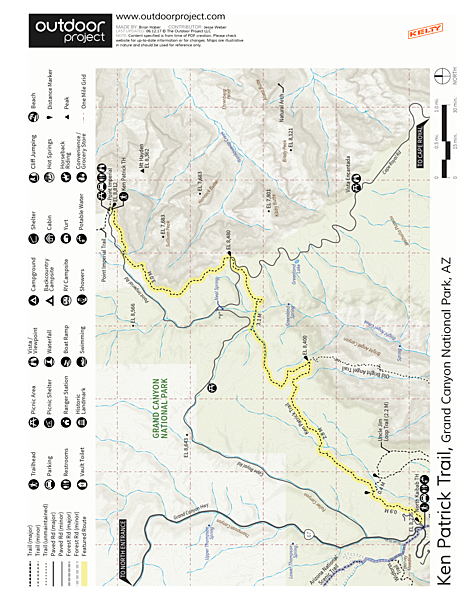 Note: If you'll be starting from North Kaibab Trailhead, the junction for Ken Patrick Trail is hard to locate and blocked by downed trees as of May 2017. To find it, hike 0.9 miles toward Uncle Jim Point and watch for the first obvious fork in the trail. This is not a real fork, as it rejoins after going around some trees in the middle. Where it rejoins, however, is where you need to cut into the woods to the left to get on Ken Patrick Trail, which is somewhat faint but visible. Uncrowded. Off the beaten path. Varied scenery. Limited canyon views. Some exposed burn areas.